THE EXPLOSIVE ROCKY KELLY !! 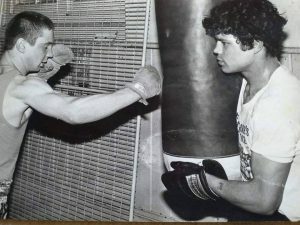 Young Rocky with Ralph Young training at Hogarth. 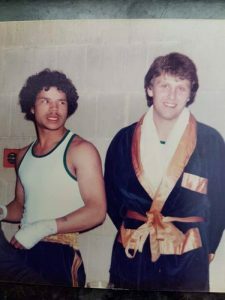 He was born in Liverpool on 5th January 1963 to an Irish mother and a Caribbean father, and he was christened Hamilton Kelly. When he was six years old he moved to Acton and, during his formative years, fate saw fit to deal him a diabolical hand. He became a wild child heading in a dangerous direction. Then he discovered boxing, and he grew up to become ‘The Explosive Rocky Kelly’. He turned professional at the age of 18, and his fans were fanatical. They loved his ferocious intensity, they worshiped his bravery, and their devotion was tribal. 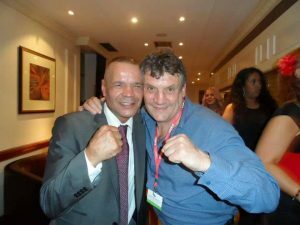 He captured the Southern Area welterweight title in 1984 which he defended three times, and he subsequently made fearless challenges for the British and Commonwealth belts against Kostas Petrou, Kirkland Laing and Gary Jacobs respectively. Throughout his life, bad luck has never been a stranger and he has had to battle through some seriously hard times, but there is something that nobody could ever take away from him. When ‘The Explosive Rocky Kelly’ climbed through the ropes, there were always fireworks. 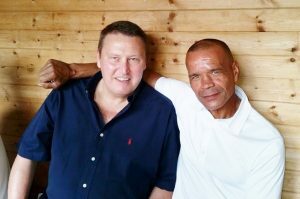 With fellow Hogarth boxer, Gary Hobbs. Tim Cowen has always remained in Rocky’s corner. With old opponent, Chris Sanigar. 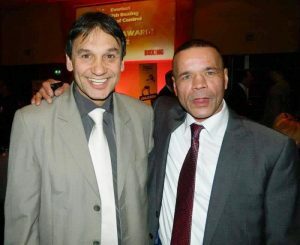 With old gym-mate, Tony Rabbetts. 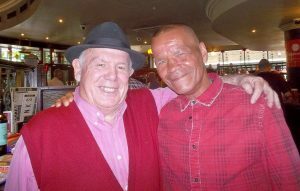 Rocky and Gary Hobbs, still pals after all these years. Yes a great lovely fella ! Like all the former Hogarth BC fellas , its always a pleasure to see , them.all the first sunday in every month down at the William.Blake public house in Old Street for our LEBA meetings ! Managed by a great fella too ! H . Holland .